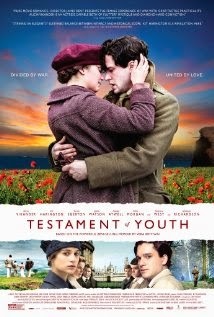 Movie Review: “Testament of Youth” is a biographical drama based on the World War I memoir by the English writer and pacifist, Vera Brittain, played here with perseverance by Alicia Vikander, the one who gained our attention some weeks ago as Ava, the robot, in the commendable sci-fi “Ex Machina”. Despite Vikander’s endeavor to get everything right, properly shaping Vera’s personality, the drama, adapted by Juliette Towhidi and directed by James Kent, never took the bull by the horns, conveying the sensation that much better should have been done. I had difficulty finding a strong emotional link with the main character. Even completely identifying and understanding her condition, I simply resigned myself to her grief in a state of indifference. Both director and screenwriter share responsibilities in the case, first because the awkward camera work didn’t win me over, and second because the story lingers more than it should in certain scenes and details, which once absorbed, should have progressed in a more straightforward way. Almost every affective connection created between the viewer and the character, at a certain point, is dissolved in the following scene, time when a new effort is required to reestablish the connection. The viewers should be spared to these relapses to avoid falling into monotony. The misty cinematography by Rob Harden, who had showed aptitude in “Ex Machina” and “Boy A”, was perfectly suitable for the time and place, and his sporadic unfocused images didn’t bother me at all. In the end, “Testament of Youth” is not so strong when intersects the anguish of loss in wartime with the pacifism that, in a noble way, started gaining life. Obviously, this point of view only applies to the film itself and not to the respectful principles and deeds of Vera Brittain.